In Term 2 and Term 4 of each year, NADC offers a full-time introductory course in Fine Arts. The course is 7-9 weeks in duration, and participants attend for 4 days per week with studies in printmaking, painting, drawing, ceramics and communication skills. 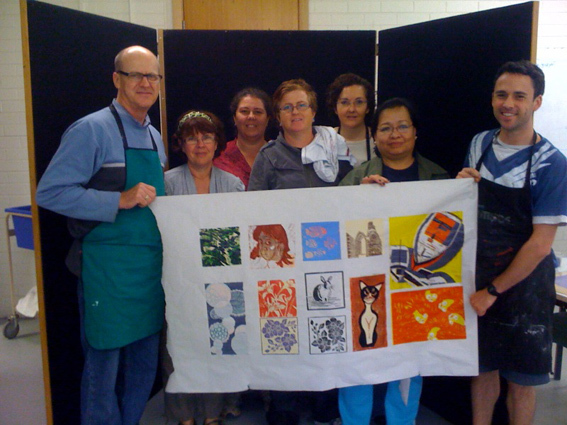 The photo above shows students from our most recent Intro course with a collaborative colour reduction lino print they produced during the course. As well as creating a limited edition of their own original print, the students produced this fun collaborative work. Class teacher Matthew Ablitt guided the students step by step in the skills required to make a colour lino print and the results were very impressive. The last Fine Arts intro course has just wrapped up for the year, with many participants inspired to go on to further study with us in 2012. Congratulations to all students on their achievements in the course. To keep informed about our courses, keep your eye on the blog and our facebook page, or bookmark the course info page on our website. The next full-time Intro course is scheduled to start in Term 2, 2012.